1 of 5 Heat oven to 400 F. Coat a 13 x 9-inch baking dish with nonstick cooking spray. 2 of 5 In a small bowl, toss the tomatoes with 1/4 cup of the pesto. Spread the fish fillets out flat on a work surface. Spoon about 1/4 of the tomato mixture over half of each fillet. Fold the other half of each fillet over the filling, using a toothpick to secure if needed. Season the fish with 1/8 teaspoon of the salt and 1/8 teaspoon of the pepper. Slice half of the lemon and place slices over top of fish. Squeeze the remaining half lemon and reserve juice. 3 of 5 Place fish in prepared dish; bake at 400 F. for 25 minutes, until fish flakes easily. 4 of 5 About 5 minutes before fish is done, microwave rice following package directions. Microwave spinach until just heated through. 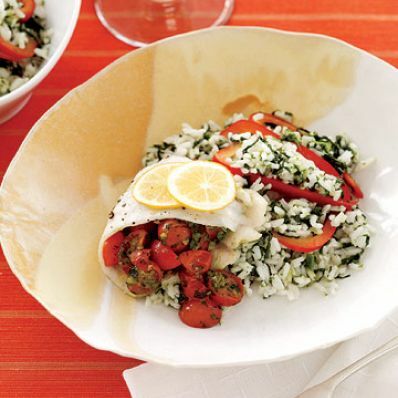 5 of 5 In a large bowl, mix rice, spinach, red pepper, remaining 1/8 teaspoon each salt and pepper, remaining 1/2 cup of the pesto and reserved lemon juice. Serve rice with fish.